On May 24, friends and family, industry leaders, sponsors, and members of the Conestoga community attended the college's eighth annual Trades & Apprenticeship Awards Presentation at the Waterloo campus. More than 180 industry and donor-sponsored awards, valued at $190,000, were presented to students to recognize excellence in the motive power, construction and industrial trades. 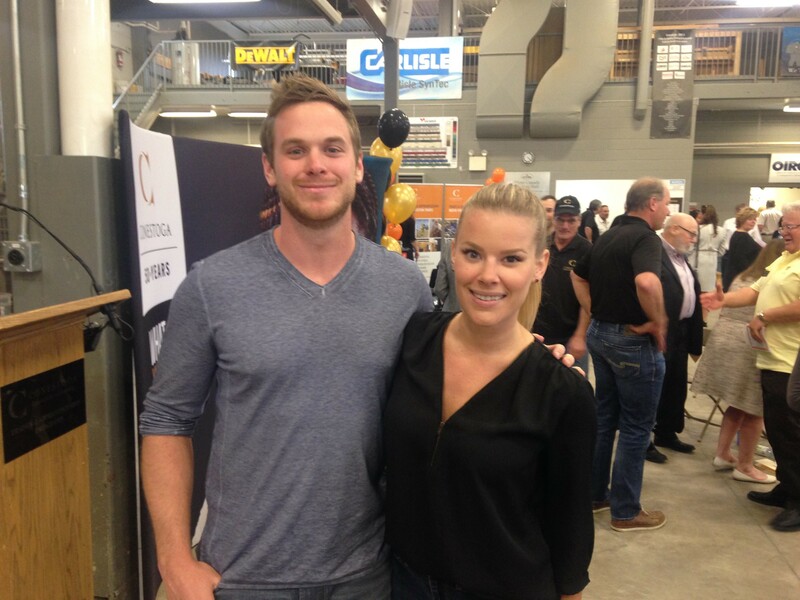 HGTV personalities Mike Holmes Jr. and Sherry Holmes presented two renovation technician awards on behalf of The Holmes Foundation at the annual Trades and Apprenticeship Awards on May 24. Mike Holmes Jr., son of celebrity contractor Mike Holmes, delivered the keynote address. Holmes is a professional contractor and carpenter featured on HGTV’s Holmes Makes it Right, Holmes + Holmes and Home to Win. He encourages youth to consider careers in the skilled trades through his work with The Holmes Foundation, Skills Ontario and Skills Canada. Although Holmes originally set his sights on becoming a firefighter, he began working alongside his father when he was 14. He said his trades career has been rewarding and reminded students that with hard work, they could have a similar experience. Holmes was accompanied by his sister, Sherry, who supports the college’s Women in Skilled Trades programs, and Conestoga events that introduce high school girls to careers in the trades. The pair presented two renovation technician awards sponsored by The Holmes Foundation. During the ceremony, Conestoga President John Tibbits congratulated students on their achievement, noting how vital skilled trades are to the region’s economy, and thanked industry partners and sponsors for supporting the awards, as well as Conestoga’s Program Advisory Committees. He also recognized Gail Smyth, executive director of Skills Ontario, in celebration of her upcoming retirement. Smyth, a former Conestoga employee, became involved with Skills Ontario as a volunteer in 1990 and was appointed its executive director in 1997. Skills Ontario partners with school boards, colleges, businesses, labour groups and government to provide opportunities for youth to explore and develop skills for successful careers in the skilled trades and technologies. Under Smyth's leadership, the annual Skills Ontario competition grew to be the largest of its kind in Canada. From 1997 to 2016, while the competition was held in Waterloo Region, Conestoga served as the host college for the event. Conestoga is a provincial leader in the delivery of trades and apprenticeship training to serve industry needs and our growing community. Comprehensive programming includes a wide range of post-secondary trades programs that provide pathways to employment in skilled trades careers as well as pre-apprenticeship training and in-school training for apprentices.